An array of Neolithic artifacts, including bracelets, axe heads, chisels, and polishing tools. 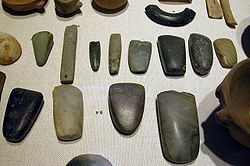 Neolithic stone implements are by definition polished and, except for specialty items, not chipped. ↑ Some archaeologists have long advocated replacing "Neolithic" with a more descriptive term, such as "Early Village Communities", but this has not gained wide acceptance.